This is giveaway #2 and we are giving away another (10) $50 Restaurant.com Gift Cards! To enter you just need to “Like” us on Facebook and fill out the form below. Registration will close in 24 hours at 6pm EST on April 12th. 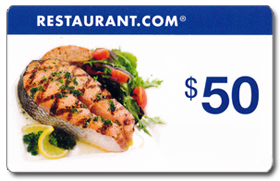 We are giving away a total of (50) $50 Restaurant.com Gift Cards throughout the month of April. The giveaways will happen at random times from now until April 30th. Winners will be chosen at random and can only win one (1) Gift Card per person. You will need to register for each giveaway period. 10 Winners will be randomly chosen and contacted by email within 48 hours after promotion ends. Only one (1) entry per person per email per giveaway period. Registeration is closed for this giveaway. Please check back for more giveaways this month. And The $50 Restaurant.com Gift Card Giveaway #1 10 Winners Are …. Thank you for all who entered the $50 Restaurant.com Gift Card Giveaway #1!! Stay Tuned we will be doing (4) Four more giveaways throughout the month of April. To the winners Be sure to check your emails with further instructions. **Each winner will receive 1 (One)$50 Restaurant.com Gift Card. The first giveaway will start now. Registration will close at 11pm EST Today April 1st. 10 Winners will be randomly chosen and contacted by email within 48 hours. Thank you all so much for entering. Sorry for the delay with posting the winners list. To The Winners be sure to check your email. Also be sure to check you spam folder just in case the email went in there for some reason. The email will be from mike@www.hunt4freebies.com. We have some really great giveaways coming up! 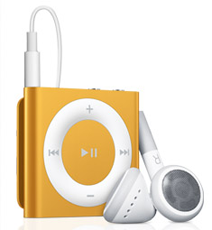 Hunt4Freebies is giving away a 2 GB iPod Shuffle to 5 lucky Hunt4Freebies readers! 1.) “Like” Hunt4Freebies on Facebook. Each winner will receive (1) one iPod Shuffle. Winners will be notified via email with further instructions. This giveaway is sponsored by Hunt4Freebies and is not associated with Apple. First we want to thank everyone that entered. 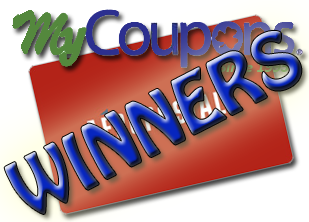 Also a big thank you to MyCoupons.com for sponsoring this giveaway. We have many more fun giveaways coming up, so keep checking back. 🙂 To the winners Be sure to check your emails with further instructions. The email will come from mike@www.hunt4freebies.com You will need to respond to the email within 48 hours. *Each winner will receive one $50 Aeropostale Gift Card! 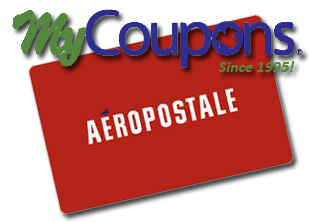 Thank You to MyCoupons.com, (5) lucky Hunt4Freebies readers will win a $50 Aeropostale Gift Card. 2.) Join MyCoupons.com VIP List, to get exclusive offers and a chance to win awesome prizes. 3.) In order for your entry to count, you must leave a comment on this post. Letting us know what has been some of favorite freebies that you have received so far. **We will randomly draw 5 winners using random.org on 5/29/2011. Good Luck! Each winner will receive (1) one $50 Aeropostale Gift Card. Winners will be notified via email with further instructions. *This is only open to US residents. First we want to thank everyone that entered. We have many more fun giveaways coming up, so keep checking back. 🙂 To the winners be sure to check your emails with further instructions very soon. You will need to respond to the email within 48 hours. 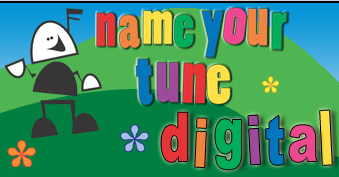 We our giving away 10 Vouchers for Name Your Tune Digital to 10 lucky Hunt4Freebies readers. The Voucher is good for a digital download of 14 classic children’s songs sung with your child’s name in them. ($20 Value) Your Child’s name must be among the more than 3000 available. Name Your Tune is a personalized collection for children that features their name more than 80 times in 14 much-loved children songs. 2.) Also for your entry to count, you must leave a comment on this post. Letting us know what your most favorite kids song is. **We will randomly draw 10 winners using random.org Good Luck! 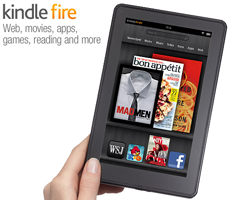 We will announce the winner Friday (5/20/2011). 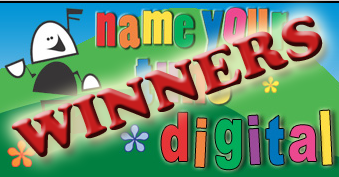 Each winner will receive (1) voucher a $20 Value to use at nameyourtunedigital.com the voucher will contain instructions and must be used by November 18, 2011. Your Child’s name must be among the more than 3000 available. First we want to thank everyone that entered. Also a big thank you to GiftCards.com for sponsoring this giveaway. We have many more fun giveaways coming up, so keep checking back. 🙂 To the winners Be sure to check your emails with further instructions. You will need to respond to the email within 48 hours. 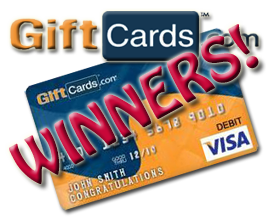 Each winner will receive one $50 Visa Gift Card!